Local officials think a population explosion for zebra mussels may be inevitable. A research scientist from New York will be in the area Thursday and Friday to discuss potential solutions. DNR officials and ecology watchdogs have been bracing for an explosion of zebra mussels — the imported and unwanted water intake clogging mollusks that have a a foothold in the Iowa Great Lakes. 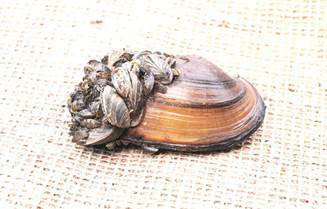 The Iowa Department of Natural Resources in November confirmed that boat hoists in East Lake Okoboji, West Lake Okoboji and Lower Gar Lake were showing signs of an entrenched zebra mussel population. They attach to hard surfaces, leave sharp shells on beaches and compete with other plants and animals for plankton and zooplankton in the water. But help could be on the way, according to Phil Petersen, Executive Director of the Iowa Great Lakes Association. Dr. Daniel Molloy, a research scientist at the University of Albany-New York will examine the area lakes to see if he can give zebra mussels a fatal case of indigestion. Molloy has a patent for Zequanox, a benign, dead bacteria that attacks a zebra mussel’s digestive track. Petersen said Zequanox has to be safe for humans as well — communities in the region draw their drinking water supply from the Iowa Great Lakes. Molloy’s program for DNR officials, lake protective association members and the general public will take place at 2 p.m. Friday, Sept. 12 in the Waitt Building classroom of Iowa Lakeside Laboratory. Petersen says anyone with an interest in learning about the impacts of zebra mussels — and local options for controlling them — should attend. “The DNR is a little skeptical, as they should be,” Petersen said. Petersen thinks Zequanox would be expensive for the large lakes found in Dickinson County, but the Iowa Great Lakes Association Executive Director supports adding Zequanox to a few trouble spots for next summer to see what happens. Molloy may have other options to control the spread of zebra mussels as well. He’s studied the animal for more than two decades.